Theatre has a long memory. Stephen Sondheim and James Goldman’s 1971 musical has been through myriad incarnations, donning and shedding numbers, an interval, an ill-conceived upbeat ending, and yet the original vision has lingered. 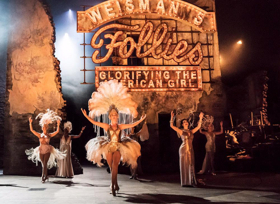 The show now comes to extraordinary life in a blockbuster National Theatre revival that proves Follies isn’t just still here – it’s thrilling, heartrending and utterly vital. This entry was posted in Dance, Journalism, Theatre and tagged broadwayworld, dominic cooke, follies, imelda staunton, james goldman, janie dee, josephine barstow, london, musical, national theatre, peter forbes, philip quast, review, stephen sondheim, tracie bennett, ziegfeld, zizi strallen. Bookmark the permalink.